Successfully Added Pocket LED Flashlight - Mini Torchlight w/ High, Low and Strobe to your Shopping Cart. 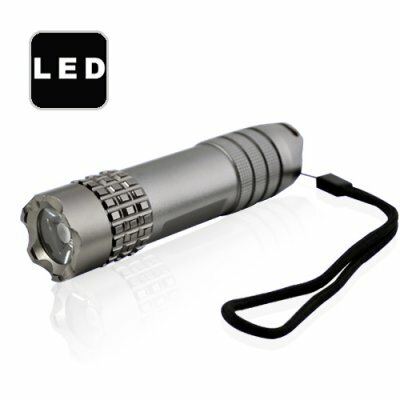 This amazing mini torchlight produces a bright white light that is powerful enough to use as your primary flashlight. It uses 3 AAA batteries and contains an energy efficient white Luxeon LED that is rated at an amazing 60 lumen output. Making this the perfect LED flashlight to keep on you at all times— or simply to keep in your car or home in case of an emergency. Carrying this torchlight with you means you’ll never be caught in the dark without a light. From lighting your way across a dark parking garage, finding your keys in a dimly lit movie theater, or signaling for help in an emergency, this mini torchlight will always be there when you need it the most. And since it’s only 119mm long with a 29mm diameter, it’s convenient to carry in your pocket without noticing that it’s even there. The best part of all is that this mini LED flashlight is priced well below wholesale price-- making it perfect to buy in bulk and resell on eBay or in your retail store. Order 10 or 20 now and we will ship your order out within 24 hours. This mini LED torchlight comes with our famous 12 month guarantee and is in stock now. Hurry, get your sample orders in now while supplies last. Excellent Resale Item, our price on the mini torchlight is lower than anywhere else on the Internet! Are these like MagLite flashlight torches? These are better since they cost a fraction of what a comparable MagLite torch would cost, are just as good in terms of performance and reliability, and comes with Chinavasion's famous hassle-free 12 month warranty! What's the difference between a flashlight and torch light? Basically in America they say flashlight, and in the UK, they call it a torch light.